Kentucky's Department of Travel and Tourism is working to expand culinary tourism across the state. Officials are launching the food focused website KentuckyCuisine.com. Department Spokeswoman Scottie Ellis says the goal is to get in on the front end of culinary tourism. "You know food is a necessary part of everyday life, but it is a very big part of travel. If you have a bad meal, it could ruin your entire experience," said Ellis. The announcement came this week at the Kentucky Travel Industry Association's annual fall conference. State Department of Travel and Tourism Spokeswoman Scottie Ellis says there's already been some attention given to eastern Kentucky foods. 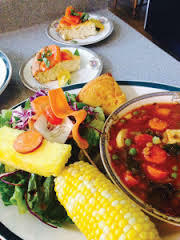 "Eastern Kentucky at this time, as we all know, really needs some positive attention and the Appalachia history that goes with their food and their recipes is just such a unique story to tell," added Ellis.